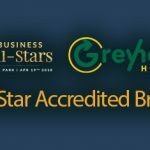 Greyhound Household are delighted to announce that we have been All Star Accredited at the recent Business All-Stars at Croke Park. Greyhound Household participated in the Business All-Star programme for 2018 and have been accredited with an All-Star for waste management. This unique accreditation is given to Irish companies that have distinguished themselves in the conduct of their business over the last 12 months. Greyhound will continue to strive for excellence through continued improvement programmes and strategic investment. All-Star title holders will have proven through a rigorous judging process, to be on merit, worthy recipients of the accolade.